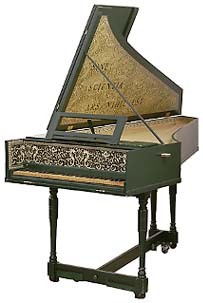 A stringed keyboard instrument developed during the 14th and 15th century, the harpsichord was widely used until the early 19th century when it was superseded by the piano. 20th century revivals of the instrument feature music of the 16th to 18th centuries with particular emphasis on Bach's music. The metal strings are sounded by plucking with a small piece of material called a plectrum which is attached to the key mechanism. A downward stroke on the key raises the plectrum on the other end so that it plucks the string and then pivots so that it does not touch the string on the way down. Generally longer and narrower than a piano, the harpsichord commonly has a shape similar to a grand piano. The metal strings are sounded by plucking with a small piece of material called a plectrum which is held in a narrow slip of wood called a jack attached to the key mechanism. A downward stroke on the key raises the plectrum on the other end so that it plucks the string and then pivots so that it does not touch the string on the way down. A drawback to the instrument is the fact that the player has no control over the loudness and quality of the tone, since that tone is produced by the single pluck. During the period of about 400 years when it was a major keyboard instrument, variations were made to partially overcome this limitation. Double sets of strings were used with separate jacks for each set. Mechanisms were used to move one set of jacks out of reach of the strings so that variations in volume and quality could be achieved. Some harpsichords had two keyboards with different sets of strings which could be coupled.